He left Judea and went away again into Galilee. And He had to pass through Samaria (John 4:3-4). Coming from Jerusalem to Sychar, Jesus would have taken the historic “Road of the Patriarchs.” It ran along the watershed ridge of the Ephraim hill country and passed through this area, the Lebonah valley. It’s quite likely, then, that Jesus and his disciples passed this way before their meeting with the woman at the well. 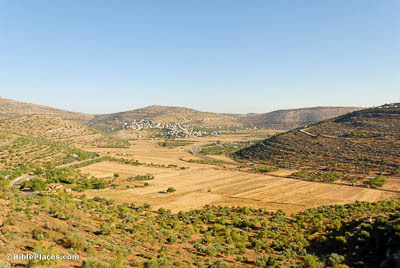 So He came to a city of Samaria called Sychar, near the field that Jacob had given to his son Joseph (John 4:5). 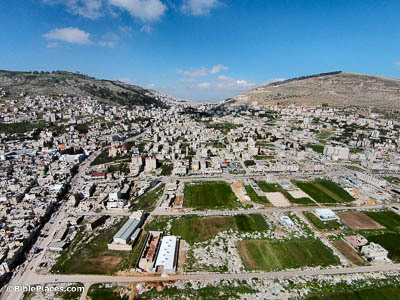 Lying at the base of Mount Ebal, the city of Sychar (now known as Askar) was probably the main Samaritan settlement in this area during Jesus’s day. The city had a well of its own, but limestone in the water supply made it less than ideal for drinking. 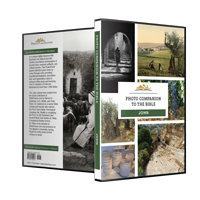 Consequently, many would instead draw from Jacob’s Well about a half mile (0.8 km) away—including the woman Jesus talks to in this chapter. And Jacob’s well was there; so Jesus . . . was sitting beside the well (John 4:6). The well where Jesus and the Samaritan met was known for the quality of its water. Even today, it still provides refreshment for many a pilgrim, supplied by a combination of surface water and underground sources. 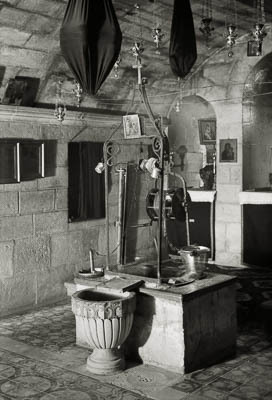 It was, of course, much less ornate in the 1st century than it is now; the well has been contained in a succession of churches through the ages, the current one being owned by the Greek Orthodox Church. Our fathers worshiped on this mountain, and you people say that in Jerusalem is the place where men ought to worship (John 4:20). 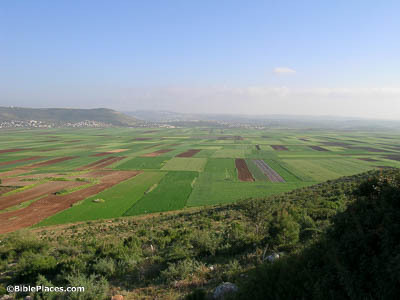 Sychar, by virtue of being nestled between Mount Ebal and Mount Gerizim, was planted in a location of deep biblical significance. It was in front of these two mountains that the tribes gathered to receive blessings and curses tied to the Mosaic covenant (Deuteronomy 27:12-13). Moses then had an altar built on Mt. Ebal; however, Samaritan tradition moved the holy site to Mt. 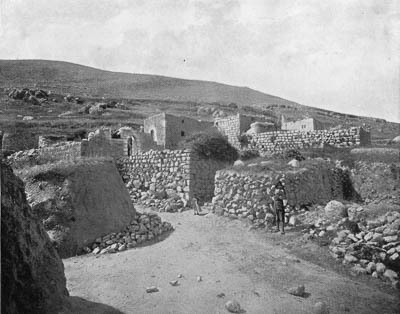 Gerizim, which served as the center of Samaritan worship. Jesus said to her, “Woman, believe me, the hour is coming when neither on this mountain nor in Jerusalem will you worship the Father” (John 4:21). In the 5th or 4th century BC, the Samaritans built a temple on Mount Gerizim modeled after the one in Jerusalem. 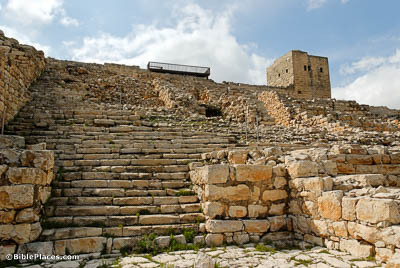 This monumental staircase, part of a later project in the 2nd century BC, led worshipers up towards the sanctuary. However, tragedy struck not long after these steps were added when John Hyrcanus completely destroyed the temple in 129 BC. By the time Jesus had this conversation, it had been nearly 200 years since the Samaritans had a functioning temple. The man believed the word that Jesus spoke to him, and he went on his way (John 4:50). After traveling through Samaria, Jesus came to Cana, where he was met by a man who begged him to heal his sick child. When Jesus promised him that his son would live, the man believed him, but wasn’t able to confirm the miracle immediately because his son was all the way in Capernaum. He needed to walk back home alone, likely through the Bet Netofa Valley pictured here, not yet knowing for certain that his son was still alive.